A Desperate Tatter: Where is this little piggy going? Where is this little piggy going? Not to market I don't think. However she does become number 7 for the 25 Motif Challenge. 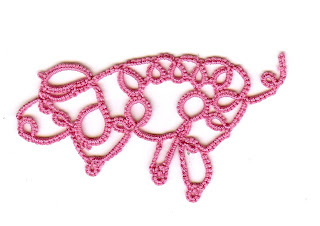 She is from Christel Weidmann's Tatting Farm Animals . I think she will be finding a new home in Nebraska when my sister gets home next week and see's her. At least you can be sure she is going to a good home. As this is the sister who wanted to grow up to be a "pig". She have a collection of pigs that she has gather up from all over or that have been given to her over the years. I have been stuck in front of the tv today watching the inauguration of the president. It was mesmerizing to watch. I did not plan on watching it all day it was just to hard to stay away from all the pomp and circumstance. We do put on a great party. At least the whole world gets to see how we do it here in the United States and it is a great statement on how system works. We are so lucky to be able to have this smooth transition of power. Now on to other things. Like tatting. I do not have anything new in the works at the moment. I was too cold to work on anything today. Had to keep my fingers warm. So what to do tomorrow. The booties are on hold for the moment. While we find out about the baby. My daughter is going for an ultrasound tomorrow and then we will know more. LOL! "not to market"! You are a crack-up! Thanks for the chuckle. It looks like you are enjoying your farm animal book!